Is Coke Good to Drink if You Have Diarrhea? You might develop diarrhea for a number of reasons, including a bacterial or viral infection, food intolerance or a negative reaction to medication. Although certain dietary choices can help reduce symptoms, other foods can worsen your condition. It's best to skip the urge to drink a Coke when you have diarrhea. Avoid caffeinated drinks, such as colas and coffees, when diarrhea strikes. Caffeine can worsen your symptoms, warns the National Digestive Diseases Information Clearinghouse. For many people, consuming caffeine speeds up the time it takes for stools to pass through their digestive systems. Caffeine generates movement in the muscles along the colon; if you have diarrhea, encouraging these muscles to move more quickly isn't what you need. In addition to caffeinated drinks, avoid foods that are excessively sweet, fibrous or greasy when you have diarrhea. If you have trouble digesting lactose, don't consume milk or other dairy products. Drink water and fruit juice to replace the fluid you lose during bowel movements. Build your diet around foods that are bland and easily digested, such as bananas, applesauce, rice, toast and cooked carrots. Diarrhea usually clears up without medical intervention. Call your doctor, however, if your stools are black or bloody, you experience prolonged stomach pain, feel dizzy, urinate infrequently or have a fever higher than 101 degrees Fahrenheit. Also, call your doctor if diarrhea symptoms don't go away in five days. 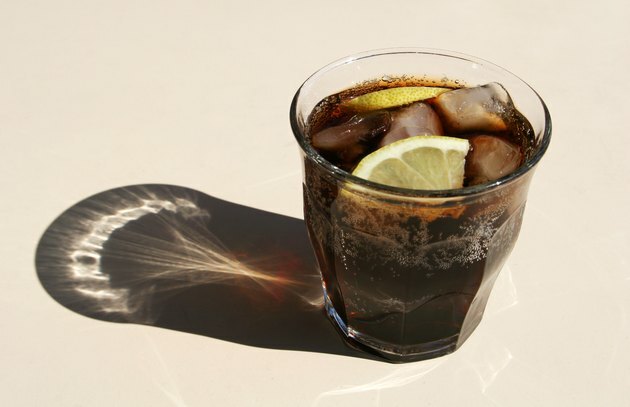 After diarrhea, still avoid the temptation to drink colas and other soft drinks. They are high in calories and sugar, which can lead to a number of health problems, including weight gain, heart disease and type-2 diabetes. Caffeinated products can result in side effects, too, such as a jittery, anxious feeling and trouble sleeping, and they can create a dependence that's tough to break. One Medical: Why Does Coffee Make Me Poop? Why Do I Have Stomach Cramps When I Drink Soda?